Do you want your students to deepen their understanding? What are your students struggling with in math? Getting students from struggling to mastery doesn't happen over night. Growing their understanding is a process. Card sorts are a great activity to get your students thinking about the why's and how's of the math. Students make sense of word problems and the steps to solve them. Having students work with partners on card sort activities helps create math talk. When students are verbal about math, they are better able to sort through their understanding and draw a conclusion. The card sort picture above is of an eighth grade sort called Writing Linear Equations. Students start with a problem and work through all the information provided. The goal is to get students to create and write linear equations. The process in getting there is broken down into three steps, finding the points, slope, and graph to write the linear equation. Students make sense of the information provided and link all the parts together to write the linear equation. Each card sort activity goes through the process of math discovery to mastery. The lesson units are intended to help you assess how well students are able to understand each grade level standard. Get your students thinking and mastering more math concepts this year. 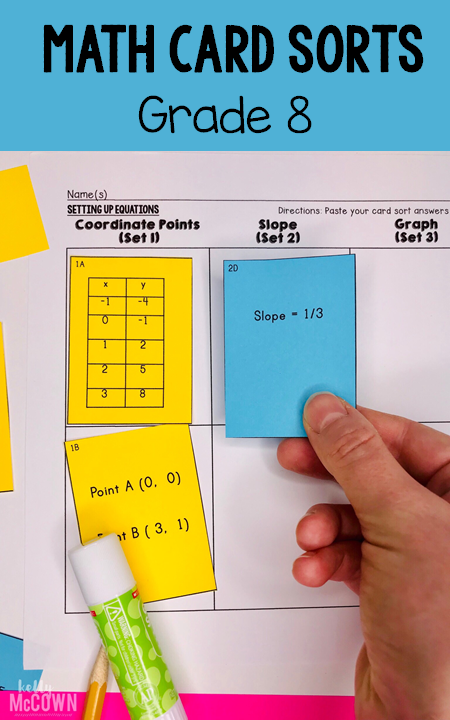 Engage your students in a math sort to deepen their understanding. Students can work independently alone or in groups to accomplish the tasks. Watch as your students go from struggling to mastery of math.